As we continue to dive into how our new Premium listening assessments (launched on January 19) work, we’ll look into how to access and review the quiz reports. In our last deep dive blog we discussed how to search and assign quizzes with your classes. The class summary report lets you easily see how students are performing overall. As students take more quizzes, their cumulative quiz data is seen in this report. You can see the percentage correct by listening skill strand. This class seems to be having some difficulty with Main Idea for example. Each quiz has a question on these four listening skill strands: vocabulary, literal comprehension, main idea, and inference. There are additional questions focused on: summarizing, drawing conclusions, analyzing purpose, point of view, evaluating reasoning, or finding evidence. So depending on the audio story, students will answer questions on 5 or 6 skill strands, but not all of them are addressed in each quiz. These skill strands are broken out on the reports to give you more data to inform instruction and troubleshoot areas your students might need additional support. To look specifically at an individual quiz, click “See Responses” next to the quiz assignment in your Classes tab. Now you’ll see the student results for an individual quiz. 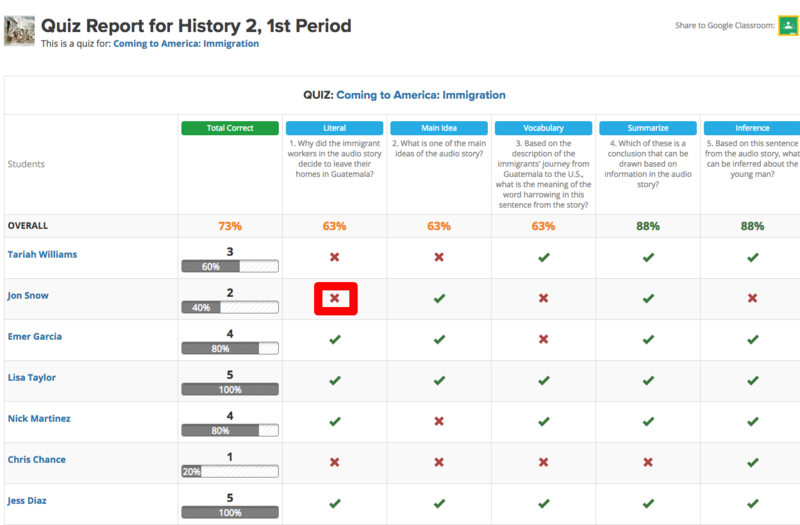 For example, look at the class data on the “Coming to America: Immigration” quiz. You can easily scan by skill strand in this report too. In this report, you can see the questions in the top row by skill strand. If you want to know the answer a student chose, you can click on the x and the details of that question is shown for you. To go deeper into the performance of a specific student, click the student name from either of these reports. Then you can see data from all quizzes the student completed, along with seeing the specific answers they chose for each question. So, take a look at a few audio stories with quizzes, and start assigning the quizzes to get data about your students’ listening comprehension skills!